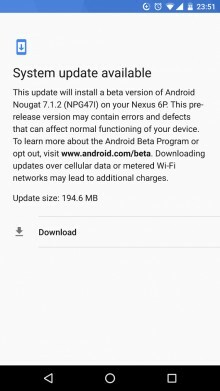 At the end of January Google outed the first beta build for Android 7.1.2, the next iteration of its mobile operating system. Today the second beta build for that version has started rolling out over-the-air to devices that are enrolled in the Android Beta Program. If you have a device running the first beta build, you too should get the update notification soon. The list of supported devices hasn't changed with this release, so giving Android 7.1.2 a try before anyone else is still only possible if you have a Google Pixel, Pixel XL, or Pixel C, Huawei Nexus 6P, LG Nexus 5X, or Asus Nexus Player. For all of those products the build number for the new software is NPG47I. With Android Nougat Google has moved into a quarterly release cycle for new incremental versions, though it is unlikely that the final 7.1.2 build will actually roll out before March (and thus Q1) is over. We assume this might become public alongside next month's security patches on April 3. Obviously that's only true for the devices Google still supports. If you have a handset that isn't a Nexus or Pixel, many months will pass before you see any trace of Android 7.1.2 on it. That however might not be such a huge loss, since this iteration of the OS is basically all about bug fixes and small enhancements here and there. It has no big new features or anything like that. I have a lenovo k3 Note k 50a40.Can I update nougat??? ?